Woop, woop. I've officially got my first Christmas decor craft of the year done, up and ready for the season! Well, my first Christmas decor of the season besides that one time I decorated my living room for Christmas in October. I am so excited about this Christmas. HDawg will only be sixteen months old, but I'm going to pretend like he understands all of the fun holiday stuff to come. That includes all of the fun stuff like Santa, Elf on the Shelf and... an advent calendar! Seriously, I fully understand that he will not have any clue what's going on this holiday season, but I do know that he will have so much fun with the advent calendar opening trinkets each day and repeating the motion of opening the bags. 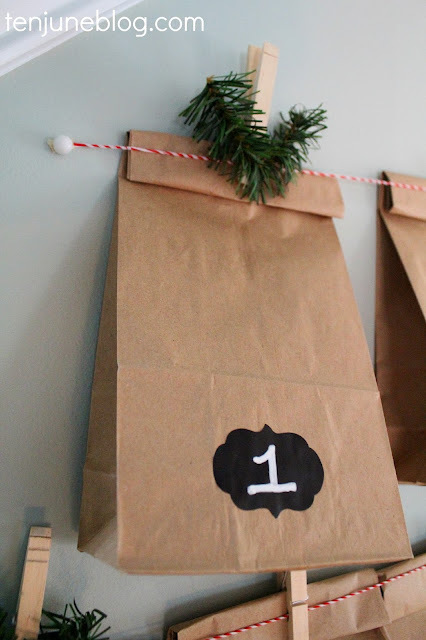 I decided to DIY an advent calendar and went with a simple paper bag + chalkboard tag version. I simply wrote the numbers for each day on chalkboard tags that I found in the dollar bin at Target. I used chalk markers instead of chalk for a cleaner look. 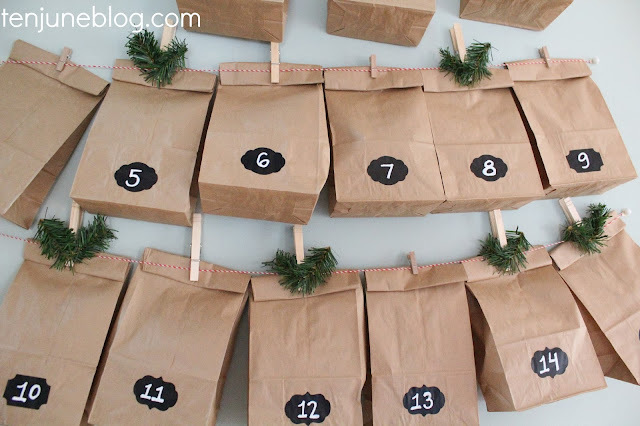 Then I clipped each bag with clothespins onto baking twine. I hot glued faux evergreen pieces onto a few of the clothespins for some extra pizazz. HDawg, if you're reading this, cover your eyes! 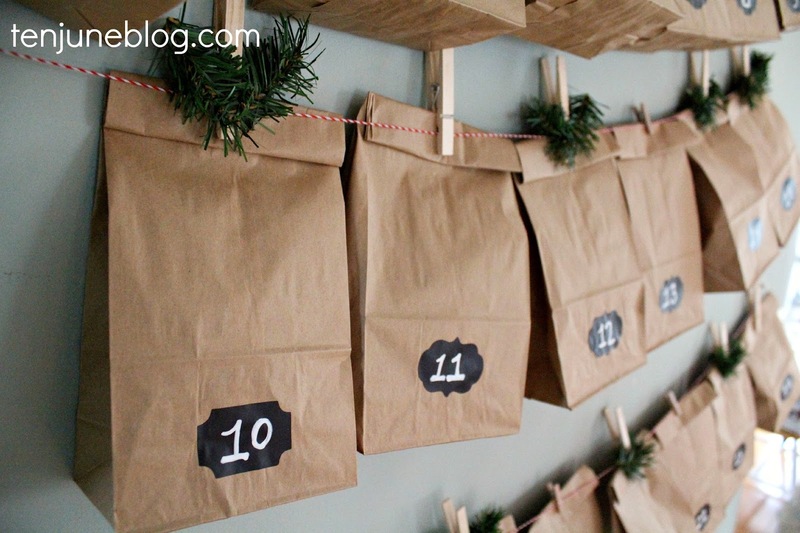 I filled each calendar bag with some sort of holiday trinket that H will love. 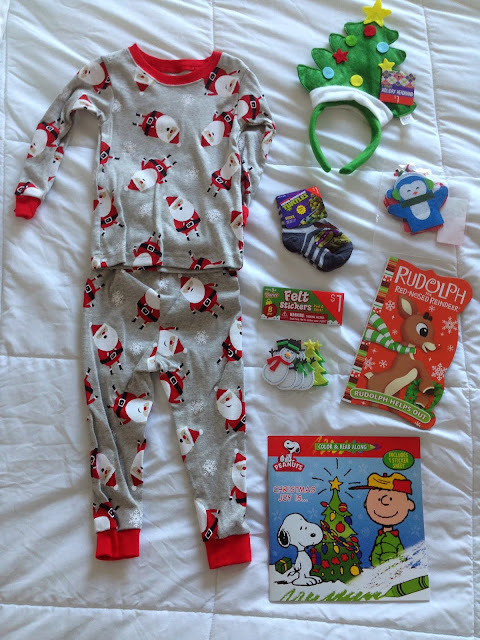 The first day is a big gift- a set of Christmas pajamas for the season! Then the rest are small items from the dollar bin like Christmas stickers, board books, coloring books and finger puppets. Oh, and Ninja Turtle socks. Because what kid wouldn't love those? And that's it, folks! Like I said, really simple. I strung the bags and bakers twine along the wall in the hallway in our stairwell. H already points to the display and smiles every time we walk past! 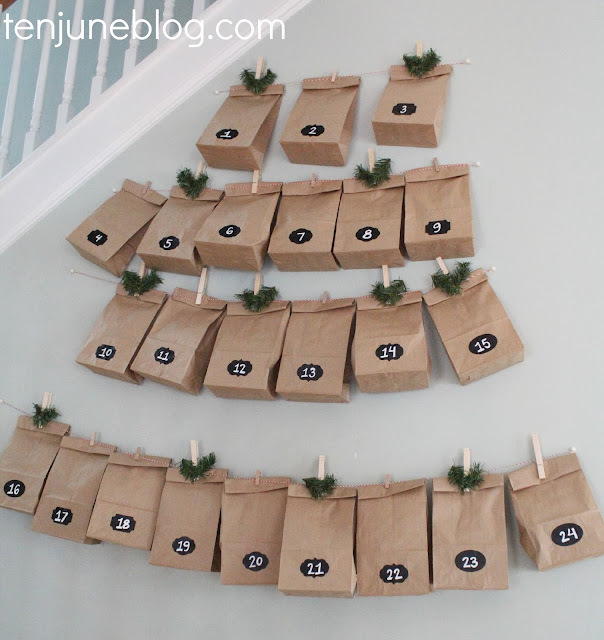 For more advent calendar inspiration, check out my post on BabyCenter today: a round up of seventeen DIY advent calendar ideas. So much fun inspiration! Such a great idea! I really like it! Where do you find chalk markers? How neat! 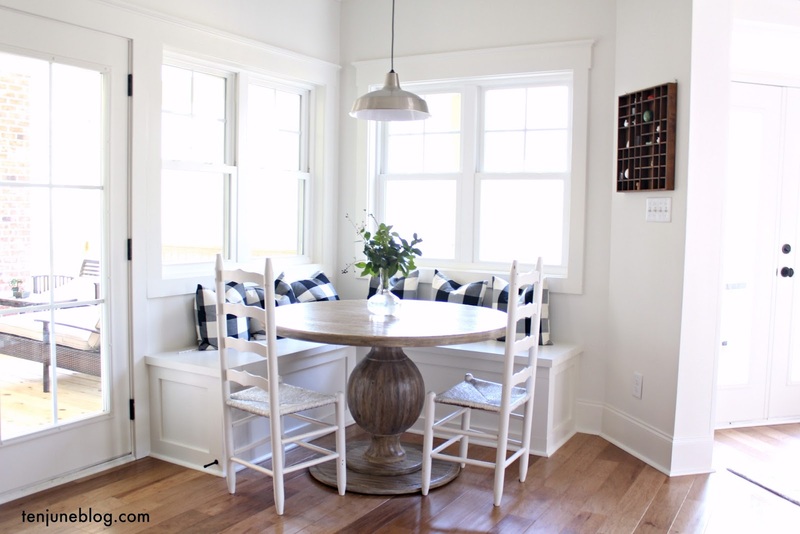 Love this, doing something pretty similar, but I have to ask, what did you use to hang them on the wall? This looks great! 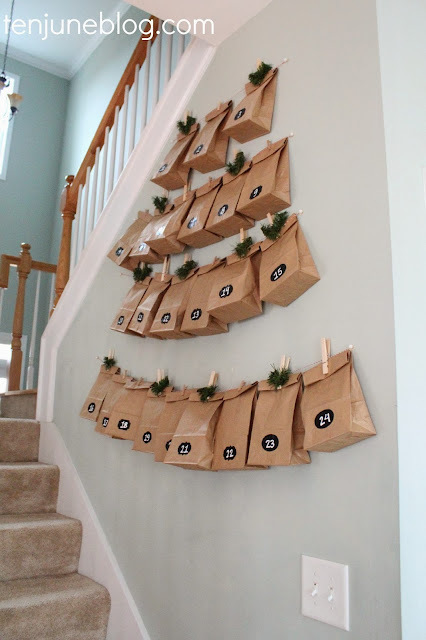 So simple but adorable and festive. I think it's awesome you are starting these traditions with him now. I think HDawg will get joy out of this even if he is little, and it's going to be great to have the memories to look back on. Hope you have a very Happy Thanksgiving! Ohh and I need chalk markers, thanks for the head's up with Amazon. SUCH a cute idea!! I totally want to do this for E now!! That's a super cute idea! I love it!